Aaron Olmsted was a sea captain from Connecticut who bid for township land. Olmsted Township began as a small part of the Western Reserve, the northeastern Ohio land claimed by Connecticut that extended 120 miles west from the Pennsylvania border. It was a five-mile-by-five-mile square designated as Township 6, Range 15. 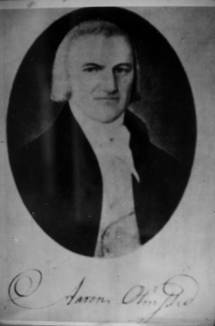 In 1795, when the Connecticut Land Company put Western Reserve land up for auction, Captain Aaron Olmsted of East Hartford bid for almost half of the township while others bid for smaller portions. It took until 1807 for the sale to be consummated. That was a year after Olmsted died, so the land went to his widow and three sons. It took until 1815 for settlers to begin moving into the township. One year earlier, Columbia Township resident James Geer planted a small crop of corn across the border in the southeastern corner of what would become Olmsted Township. But he and his family did not build a cabin and move in to become the township’s first settlers until the following spring. Later in 1815, the Stearns family began settling on the northern end of the township. In subsequent years, others, who came mostly from New England, moved in. Some of those early families are commemorated in the names of roads around the township, including Stearns, Fitch, Cook, Usher, Schady, Jennings, Sprague, Bronson, McKenzie and Lewis. 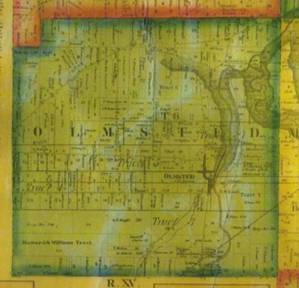 Olmsted Township was still almost a perfect square in 1858, when this map was printed. In the early years, the township went by different unofficial names, including Plum Creek Township and Kingston Township. In 1823, when it was organized into a civil township, the most basic form of local government in Ohio, it became Lenox Township for unexplained reasons. In 1825, the Ohio General Assembly decided to split the township with the western half going to the newly formed Lorain County and the eastern half going to Middleburgh Township in Cuyahoga County. That did not sit well with residents, who persuaded legislators to put the township back together, which occurred on January 29, 1827. 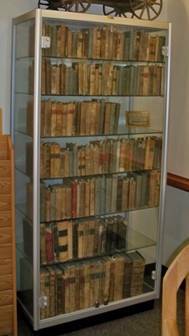 About 150 original Oxcart Library books remain. After the Olmsted Township Rural School District built one school in 1916 to replace several smaller schools throughout Olmsted Township and Olmsted Falls, the district used wooden, horse-drawn “kid wagons” to transport students. They later were replaced with school buses. Olmsted Township again was in the regional lead early in the 20th century when it merged its rural school district with the village school district of Olmsted Falls. The combined school district then built a new school in 1916 to consolidate all of Olmsted’s students into one facility, which replaced several schools scattered around the district. Thus, the Olmsted Township Rural School District became the first district in Cuyahoga County to eliminate small, independent schools, some with only one room. Because students in outlying parts of the township could no longer walk to school, the district employed horse-drawn “kid wagons” to transport them. They were forerunners of school buses, which replaced the wagons about a decade later. 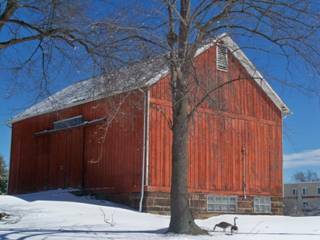 The barn that John Hall built in 1880 along John Road stood as a testament to Olmsted Township’s agricultural past until it was removed in 2014. Throughout most of its history, agriculture was the township’s main industry. In the late 19th century, a newspaper columnist called Olmsted “a fine farming region, high and dry with good air and water.” Crops included wheat, corn, oats, hay, potatoes, apples, peaches, grapes and several kinds of berries. Farmers also raised livestock, including sheep, goats, hogs, cows, chickens and turkeys. In the 20th century, many greenhouses were established in the township and neighboring communities so that Olmsted Township became part of what the Plain Dealer called “the largest greenhouse area in the country.” Some greenhouses still operate, and Olmsted Township is rare in Cuyahoga County, the most urban county in Ohio, in still having a few traditional farms. 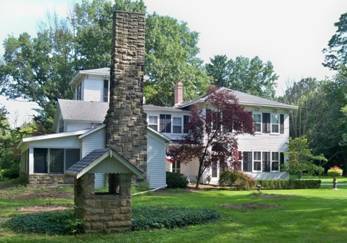 The section of this house at 25390 Nobottom Road next to the big chimney began as a cabin in 1820. Olmsted Township is home to the headquarters and manufacturing facilities of Vitamix, a nationally known company with a place in broadcasting history. In 1949, company founder William Barnard bought a half-hour of television time on WEWS, Channel 5, to pitch Vitamix blenders. That is regarded as broadcasting’s first infomercial. Since the mid-1800s, two villages that have become cities, Olmsted Falls and North Olmsted, have been incorporated from parts of Olmsted Township, while smaller portions have been annexed to Berea and Brook Park. But Olmsted Township is rare in Cuyahoga County as the larger of only two remaining townships. The township still has about 10 square miles of its original 25-square-mile territory. 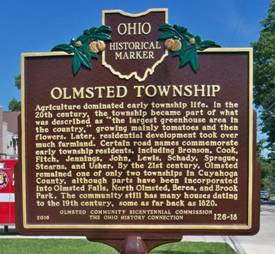 In 2016, the Ohio History Connection, a state agency, recognized and commemorated Olmsted Township’s history with an Ohio Historical Marker that stands near Township Hall along Fitch Road near Cook Road. Township Hall was built in 1939. 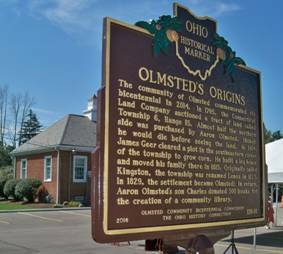 The Ohio History Connection provided this marker in 2016 to commemorate Olmsted Township’s history. It stands near Township Hall, which can be seen on the left side of the left photo. The side facing north is on the left and the side facing south is on the right.